Everyone in the field of Marketing knows of Philip Kotler, author of Marketing Management, the seminal graduate level marketing textbook. Dr. Kotler turned 86 this year and has no desire to retire. In 2013, Kotler wrote 56 columns for a newspaper in Japan. These became the foundation for his latest book My Adventures in Marketing. A more appropriate title would be My Adventures because in it Kotler incorporates all aspects of his life and career, from his personal life to art collecting to launching non-profit organizations to thoughtful social, economic and political commentaries. Because each chapter is based on a separate column, they cover a wide variety of topics. Even so, it is evident throughout the book that Kotler’s decision to switch from Labor Economics to Marketing early in his academic career would prove to be beneficial to countless students, marketing managers and even entire countries in the decades to come. 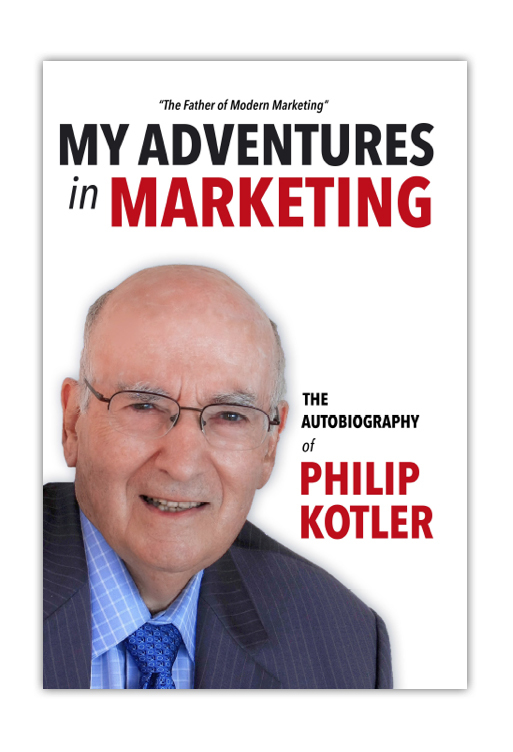 Kotler consistently pays tribute to those who helped him write his many books and those who hired him throughout his career, particularly the Kellogg School of Management at Northwestern, who hired Kotler even though he had no formal training in Marketing. Kotler was not satisfied with existing Marketing texts because they lacked mathematical and analytical research, so he did exactly what he teaches all marketers to do- create a product to meet the need. The result was one of the greatest business books of all time. Never one to rest on his laurels, Kotler became a marketing guru and consultant to businesses worldwide and mentor to non-profit sectors, including educational institutions, churches, museums, and performing arts organizations. My Adventures in Marketing is not only a comprehensive overview of the evolution of modern Marketing, but it is also a well-crafted vehicle for Kotler’s valuable insights on Social Marketing, Corporate Social Responsibility, Brand Activism and Conscious Capitalism. In the early 1970s, Kotler was highly involved in the Social Marketing movement. He writes that the purpose of Social Marketing is to “persuade folks to adopt behaviors that are better for family, friends and society. We decided to call such ‘social marketing’- short for ‘social cause marketing’.” One example he gives is that of Thailand’s promotion of condom use for family planning. Another is AIDS education in the U.S. in the 1980’s. Now Social Marketing has become a field unto itself that is practiced around the world. Kotler refers to it as a key to ameliorating social problems. Kotler applauds a number of companies and their respective causes, such as Kraft (reducing obesity), GM (traffic safety), Levi’s (AIDS prevention), Motorola (solid waste reduction), Shell (shoreline clean-up), and Starbucks (rainforest protection). According to Kotler, Brand Activism is the next stage of branding. Positioning is no longer enough in highly competitive markets. Young consumers typically do not watch TV or read newspapers, so branding is shaped significantly by digital word of mouth. Ben & Jerry’s, a division of Unilever, was one of the first to make social mission equal in importance to product and economic mission. Another successful example is Patagonia, which donates 100% of their Black Friday sales to grassroots organizations that are working to create positive change for the planet in their own backyards. Seventh Generation, another Unilever subsidiary, is a B-corporation whose mission is to inspire a consumer revolution that nurtures the health of the next seven generations- based on the Iroquois principle of making decisions with the welfare of the next seven generations in mind. Dissatisfaction with these shortcomings are part of what inspired Whole Foods co-founder John Mackey and Babson College Marketing Professor Ray Sisodia to write Conscious Capitalism: Liberating the Heroic Spirit of Business. Modern consumers, led by millennials, love to support companies that produce good products and services in socially responsible ways. Higher purpose – Conscious capitalism challenges the old dogma that profit is maximized by focusing solely on the bottom line. For example, improving the nutritional quality of food products. Stakeholder integration – Conscious capitalism encourages a team feeling among stakeholders, namely customers, employees, distributors, suppliers, community and environment. This leads to greater satisfaction not only for customers but also for all of the stakeholders. Conscious leadership – Business leaders must be motivated primarily by service and the creation of value for all stakeholders. CEO’s used to be paid 40 times that of the average worker. Today, it’s often 400 times the pay of the average worker. Conscious culture and management –A successful company is built on values of innovation, collaboration, empowerment of participants, accountability, transparency, integrity, egalitarianism, love and caring. Heather Andersen, is a marketing consultant with Resultrek, an Atlanta-based strategic marketing consulting firm.